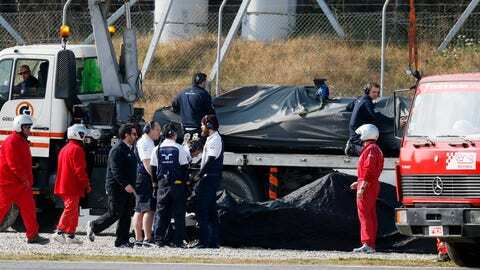 The Williams and Sauber teams recover the cars of Susie Wolff and Felipe Nasr from the Turn 5 gravel trap. The Formula One cars took to the circuit Thursday morning in Barcelona to begin Day 1 of the second preseason test in 2015. Yet for many teams, Thursday didn’t quite go to plan, with sick drivers in the Mercedes camp and a sick cars in the McLaren and Lotus camps. No one exited the session quite as dramatically, however, as Sauber’s Felipe Nasr and Williams’ Susie Wolff. Both drivers were able to walk away. More to follow ….